[AUTO]:When this unit is placed on (VC), choose five <Zeroth Dragon> from your bind zone, and call them to separate (RC). [CONT](VC):You cannot ride and call rear-guards other than . All of your units do not return to your G zone and are unaffected by any influence other than this card and your guardians. Your rear-guards cannot be attacked. [AUTO](VC):At the beginning of your turn, deal one damage to your opponent’s vanguard for each on your (RC). Wrapping up the week is Gyze. I actually have an entire article dedicated to my opinion on Gyze, which I’ll leave here so I don’t have to type it out again. But long story short, it’s sacky, you’ll be constantly 1-to-passed because you don’t gain power with Neon Gyze, and it can’t really be compensated for with skill. I will however say that since the article, my thoughts on it have been a bit kinder. There IS one deck that can use Gyze well, and that’s Nociel. You simply use Love Sniper Nociel to get hand to guard, even when you don’t gain power from Neon Gyze, search your Ultimate Stride fodder with Candle Celestial, and Rescue check during their battle phase to increase chances of trigger scoring. The card won’t work in too many other decks owing to how unreliable chance is, but this isn’t HORRIBLE. What’s up, Rogue Squad?! To wrap up our sneak week, I say we end it with the proclaimed devil of Cray itself, Gyze. Now, while I DID make a video about Gyze already (*hint go to my YouTube channel hint*), I’m more than happy to repeat certain things I said in it. To set up for G4 Gyze, first off, you have to fulfill Neon Gyze’s skills, which involves binding at least 5 Zeroth Dragons from your G Deck, and in order to do that, when you trigger check while Neon Gyze is in the G Deck (again, through Neon Gyze’s skill on ride), you lose the +5k that triggers normally grant and bind a Zeroth Dragon instead, but once you do and perform an Ultimate Stride, you get this 30k base power monstrosity for the rest of the game, which said Game won’t last very long considering that you get to call five Zeroth Dragons from the bind zone and at the start of your next turn, your opponent takes a Damage for every Zeroth Dragon on your field, which will be five so long as they’re still there. 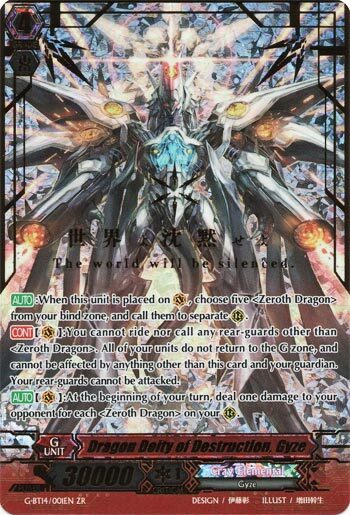 With that said, Gyze and the Zeroth Dragons aren’t going anywhere as they become untouchable to everything with one major exception, and that’s by a game mechanic (namely cards that force you to place cards on the field in a locked state that’s not technically calling). The only real drawback is that it does take some time to fulfill the prerequisites, but once they’re filled, you pretty much have a game-winner here. Next Time: My guess: more G set 14. Previous articleSuper Smash Bros. is coming to Nintendo Switch later this year!